This part of my webpage is dedicated to my friend and colleague Heather Gibbs without whom my project would be considerably less effective and productive than it is. Heather and her dedication and constant help to me, GFN and indeed shorebirds throughout the EAAF will be sorely missed. These are generated from the multiple sightings of marked birds once they are banded and released back in to the wild. Then due to intensive resighting work the life history of individuals is built up. 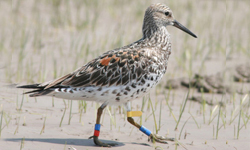 Some birds are seen very regularly on the northern shores of Roebuck Bay where they were banded. Some ‘disappear’ and show up years later. Some move about 160km to the south west and make 80 Mile Beach their home and we see them when we conduct resighting work, counts and banding there. Some ‘live’ at 80 Mile Beach but visit Roebuck bay for a month before they depart for China on their northward migration. 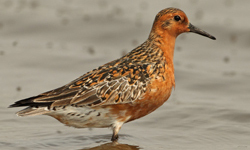 Some Red Knot are banded in Broome and then head off to New Zealand to spend the rest of their non-breeding seasons there. WE can follow our young birds and our old birds. GFN’s work in Bohai Bay generates a remarkable set of sightings and other shorebird researchers and enthusiasts send records from throughout the East Asian-Australasian Flyway that helps us build up an accurate picture of some individual’s migration strategies, non-breeding location preferences and other aspects of their ecology. GFN now has a post-doctoral researcher Dr Tamar Lok from the University of Groningen employed to do the hard science but I want to get out to my volunteers and the wider shorebird world some of the information that the project has generated from resighting work. I will use the ‘resighting history’ page from the GFN database and give an overview of a few different individuals. The resighting history looks a little difficult to follow at first but is really very simple. I urge you to have a look through the ones I use. GFN commenced colour-banding Bar-tailed Godwits on December 30 2005. 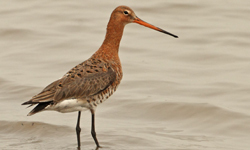 Bar-tailed Godwit are one of the most numerous migratory shorebirds in Roebuck Bay. However as they are often roosting close to the tide edge in front of a thick band of knots they are not always caught in large numbers. They use all of the beaches to roost on along the northern shores and also Bush Point in the south of the Bay although we do not catch there. They do not leave the Bay after heavy rainfall like the Black-tails but they will roost behind the mangroves on flooded saltpans. The pans can become flooded from rainfall or during the bigger spring tides. 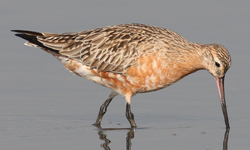 The overseas records of colour-banded Bar-tailed Godwits come from the coast of China, predominately from Yalu Jiang National Nature Reserve, South Korea and we also record a few at Bohai Bay during our spring migration studies there but Bar-tailed Godwits are not numerous at Bohai. On southward migration there are some records from the China coast and also the west coast of Kamchatka.